Thao Quynh has 15 years of experience in the financial service and investment industry. She was the investment portfolio manager for two European funds with US$280 million of assets under management. Prior to that, she worked as a financial analyst and research manager for leading brokerage houses in Vietnam. She started out with a university tuition loan to create the asset of knowledge and it is this knowledge that has given her financial security. She believes in diversifying across various asset classes and allocates about half of her wealth to investing in the stock market investments. Thao holds a master’s degree in international business from SKEMA Business School in France and an MBA from the French-Vietnamese Center for Management in Vietnam. Today she is serving her country as an investment manager and portfolio strategy manager at Vietnam Holding Asset Management. 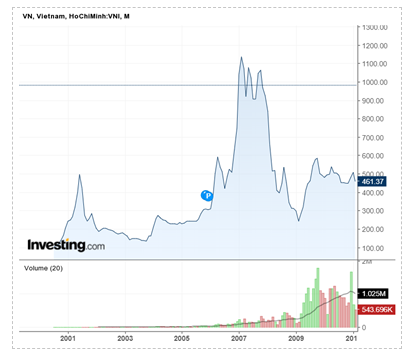 The year 2007 was a boom time for the relatively young Vietnamese stock market and everyone was excited about the kind of profitability in which returns of double or triple were quite normal. The VN index chart had soared from around 680 in late 2006 to its peak of around 1179 in March 2007. Several companies were trading at 70 times PE and 100 times PE, showing what is considered a bubble at that point. The founders were successful entrepreneurs with rich experience in leading other big financial institutions in Vietnam, with one a former director at Merrill Lynch. The information was transparent and its financial statement was audited by a Big Four accounting firm. So all up, it had good financing potential, network advantage, and management capability. This investment was at first a big success. Two months in, the stock price had gone up around 18%. But Thao didn’t sell because, by her own admission, she got greedy and expected it go higher. She even rejected an offer to buy her shares on the over-the-counter (OTC) market at 2.5 times her cost price. Thao doubted that the bubble would burst at that time because everyone was expecting robust growth in the economy since the country had just joined the World Trade Organization (became a member on 11 January 2007) and that this would be a good catalyst for corporate performance and stock prices. However, the unexpected happened when that same year the Vietnam stock market showed for the first time some correlation with the US market. The global financial crisis was showing early red flags with the Lehman Brothers collapse. Her investment went from a profit of 2.5 times to a loss of 50% in just a year and liquidity was a big factor as no one wanted to buy after the bubble had burst. Regret hit Thao over this investment but she decided to ignore it. She consoled herself that the stock price would recover one day. But that only happened nine years later. Thao sold her investment in 2016 at break–even point on her initial price. 1.Be aware of a bubble – Typically during such times, market sentiment is overly optimistic and people go a little crazy. We should be careful about that kind of positivity. “We may get crazy with them too”. 2.Liquidity is extremely important – Especially when you want to sell your shares. The big picture matters – A lot of times investors get caught up in the small picture about a company they are investing in, but even great companies can crash if there’s a shift in the industry or if there’s a bubble. This is critical to know. Over-the-Counter (OTC) markets – If a company has issued shares but it has not listed them on the stock market, there tends to be an OTC market where you can sell them. Vietnam is unique as a frontier market – There’s not much liquidity in most frontier markets. There are a small number of companies at the top of the market that have liquidity. But there are a large number of companies at the other end of the market that do not have liquidity. Liquidity really matters when you want to sell. Try not to invest in something that doesn’t have $1 million a day in average daily turnover. Watch the volume charge, particularly in frontier and emerging markets, to make sure of its consistency. It’s a red flag when we change the reason why we own a stock – Maybe you liked management or had other reasons, but when you change your reason for holding a stock, then that should be cause to pause and take your thinking to a higher level. Opportunity loss – This is a common situation and is one of the many behavioral biases in which we hang on to an investment for too long to regain the money that we have lost. If I didn’t own this stock today, would I, knowing what I know now, buy it today for my portfolio? If your answer is yes, then just keep holding it. But if your answer is no, then it may make sense to sell it. There are a hundred different potential stocks that you may find interesting that you could put that money in to. 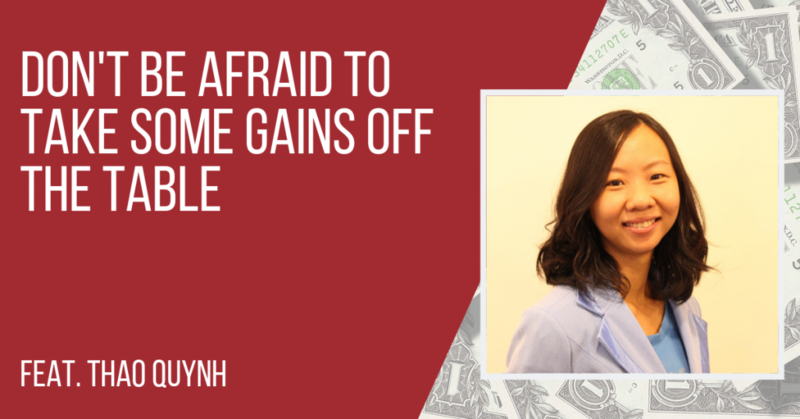 Thao hoped her story would help listeners improve their investment performance. Thao suggests to continue learning, research every investment carefully and be disciplined with carrying out valuations. Thao has started working on her own business, which is educating children in finance and business practices. She is very excited about this project and will be working on it for the next year in the hope that it’s a great success. Be disciplined with the valuation when it gets super high. But, there is nothing at all wrong with realizing a little bit of gain.